ActiveGear is a company that manufactures fitness accessories and equipment designed to provide maximum protection and pain relief while working out, specifically for after injuries and recovering from them. Designed to feel as natural as possible and to leave no restrictions or discomfort, their products are suitable for both easy afternoon runs and intense physical workouts, even weightlifting and country-cross training. Both, professional athletes and general public have recognized ActiveGear knee brace as an excellent product that is more durable than other similar braces. It can be used both to protect knees from injuries and help minimize pain and protect knees from any other damage, if an injury has already occurred. ActiveGear knee brace is also suitable for workouts after injuries. And strongman competitions have even recognized these knee braces as favorable product and have legalized the utilization of these exact knee braces in international competitions. Running and exercising with unsuitable footwear or on hard surfaces can cause knee trauma, but with knee brace it can be prevented. On top of that, if injury has happened, knee brace can help to heal it faster. The main feature of ActiveGear knee braces is pain relief and additional support to your knee after an injury. Often after knee trauma people are prohibited from working out or simply cannot do any physical training due to pain. That’s where ActiveGear knee braces come in, because they minimize discomfort and pain thanks to their design and carefully selected materials. With these braces the knee is kept warm without making it sweat and pain is relieved. Additionally, the knee brace is genuine comfortable, as it feels as if you weren’t wearing anything on your knee, but it still it keeps the knee in place and injury-free during your workout. 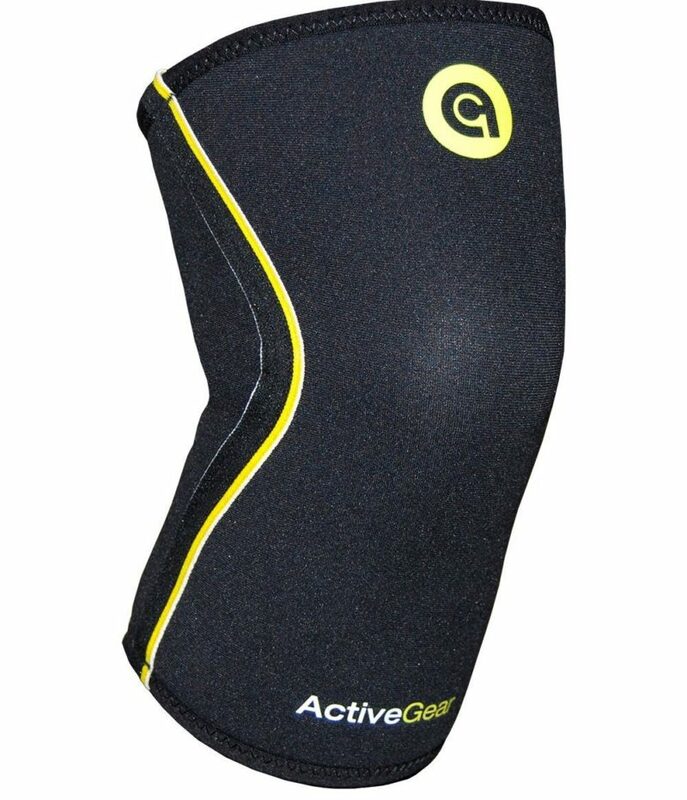 ActiveGear knee brace comes in a stylish black color with yellow accents of stripes and logo. It is shorter in length and a bit thicker than other similar knee braces, however the support of the ActiveGear brace is much more firm, providing extra comfort and support for your injured joints. In addition neoprene, the material of which the ActivGear knee brace is made out of, keeps your knee warm, preventing you from pain and any further injuries. This knee brace is available in five different sizes – small, medium, large, extra-large and extra, extra-large. And the sizes are determined according to leg circumference, small starting from 11.5 inches (29.2 cm) and going up until 20 inches (50.8 cm) which correspond to extra, extra-large knee brace. If you are looking for a knee sleeve that is suitable for everyday activities as well as more intense workouts, then this ActiveGear knee sleeve is just for you. It will protect your knees against injury. And, if you have already suffered a knee trauma, this knee sleeve will provide pain relief and additional support for your knees, so you can exercise without knee pain or discomfort. The ActiveGear brace is made out of durable yet comfortable neoprene material and comes in a sleek black color with yellow accents. The knee sleeve is available in five different sizes from small to extra, extra large, so they can be used both by teens and adults. The contoured fit will prevent any slippage during wear. And both IPF and IWF have deemed these knee pads legal to be used in competitions.